Blue Flame Ijen Crater, Banyuwangi was known as one of the most wonderful craters in Indonesia. The existence of Blue Flame Ijen volcano make all visitors curious to know, whether is it really exist on Not every night? until huge domestic and foreigners doing Trekking to Ijen volcano only to know about the process of Blue Flame Ijen appearance, After they get the Ijen Crater top, they are really gain original response that Blue Flame Ijen Crater has really existed every night. moreover, they also know about a processing how the local miners doing activity taking sulfur from the bottom Ijen crater, green acid lake and yellowish sulfur which appears from the Ijen crater pipe and only appears every night exactly begin at 18.00 PM and finish at 05.30 AM. Since National Geographic mentioned the electric - Blue Flame Ijen crater, tourist numbers visit this volcano increased up to thousands every week. The Stunning Electric-Blue Flames Ijen Crater, erupted from volcano only occurred every night wherein a dazzling electric-blue flame Ijen Crater can often be seen streaming down the mountain at night, the blue fire glow unusual for a volcano with lava. The glow of blue flame Ijen volcano is actually the light from the combustion of sulfuric gases, Grunewald explained, that the gases emerge from cracks in the volcano at high pressure with temperature up to 1,112°F (600°C). When they come in contact with the air, they ignited, sending flames up to 16 feet (5 meters) high. Some of the gases condense into liquid sulfur, "which continues to burn as it flows down the slopes. Blue Flame Ijen crater was described in antiquity in Italy on the south slope of Mount Vesuvius and on the island of Vulcano. Blue fire Ijen Crater may also be observed at the base of the plume of erupting volcanoes when ash explosions occurred. Blue Flame Ijen Crater, Banyuwangi is the subject of a new documentary released earlier this month that was produced by Grunewald and Régis Etienne, the president of Geneva's Society of Volcanology. at the top of the volcano is the largest measure such body of water filled with hydrochloric acid. In fact, it's the acid that makes the water green. Cynthia Werner and Grunewald are a research geologist with the U.S. Geological Survey (USGS) at the Alaska Volcano Observatory, Werner explained how the lake became so acidic: The volcano emitted hydrogen chloride gas, which reacted with the water and formed a highly condensed hydrochloric acid with a pH of almost 0. The lake has a volume of 1.3 billion cubic feet (36 million cubic meters), or about 1/320 of the volume of Oregon's Crater Lake. As the burning gases cool, they deposit sulfur around the lake. Blue Flame Kawah Ijen always appears every night, The trekking condition to reach Blue Flame location is easier than Semeru volcano hiking but You must use a local guide because of trekking on midnight. If You need to see the processing of Ijen Blue Flame, You must begin your trip from the nearest area like Banyuwangi or Hotel around Sempol. very recommended to start from your Hotel around Ijen Crater at midnight around 00.00 - 01.00 AM. Hope you bring complete equipment such as Flashlight, Trekking Shoes, jacket, hat trekking pole, and grass mask. If You start your trip from Banyuwangi, very recommended using private Jeep available around Banyuwangi area. the trip from Banyuwangi or Bondowoso is 2 hours by Car to Paltuding (parking lot), from this parking lot, do climb to Ijen Crater rim for 2 hours accompanied by local guide then continue climb down to bottom crater for 45 minutes, Reach the bottom of Blue Flame crater, You will see stunning Blue Flame Ijen appears from crater dome called Blue Flame. Finish enjoy Blue Flame Ijen Crater tour, come back to the rim and see the green acid lake and yellowish sulfur while You can take a photo for local miners hauling the Sulfur from bottom crater until the finish and return to Paltuding again. You will finish enjoying Ijen Crater Tour package at 09.00 AM. If You want to combine your trip between The Blue Flame Ijen Crater with other nature tourism in East Java, You can choose the tour package of Ijen Crater, Mount Bromo, Madakaripura tour 4 days. So, You can choose arrival in Banyuwangi and finish at Surabaya International Airport. Or You can visit Our contact for detail information. Ijen Crater also called Kawah Ijen in Indonesia language, Mining a sulfur in Ijen volcano is the one way to earn money by sulfur miners. Sometime the miners spraying water from a small pump onto the pipes to promote cooling and condensation. Sulfur stalactites sometimes form from the liquid sulfur dripping from the pipes then collected and sold to tourists. Sulfur miners at Ijen Crater work at night under the eerie blue light flame to escape the heat of the sun and to earn extra income. The miners sell the sulfur for about 600 Indonesian rupiahs per kilo (less than 25 U.S. cents per pound). They can carry loads of 176 to 220 pounds (80 to 100 kilos) once a day or twice if they work into the night. 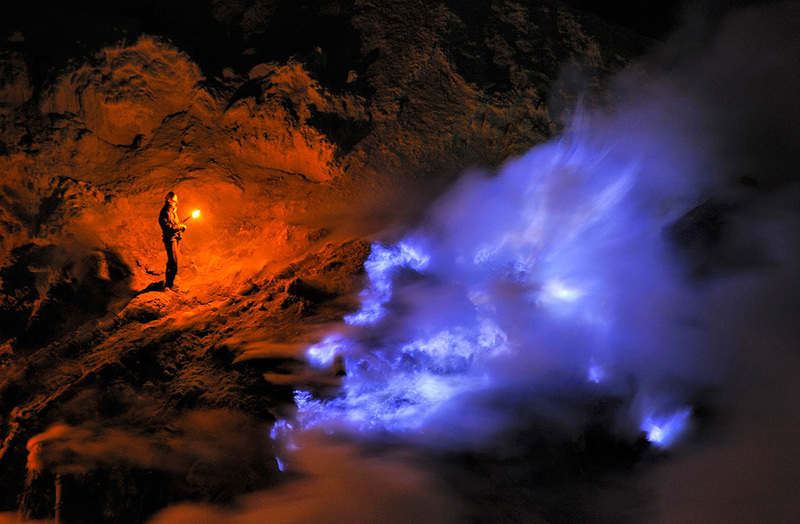 Blue Flame Flame Kawah Ijen Banyuwangi on March - September. Before You have planning to see this Blue Flame crater, You can bring Jacket, Gloves, Long Pants, Hat, Gass Mask, Trekking Pole, and Mineral drinks. In order, You can make adaptation during You are inside the Crater dome. detail information about Blue Flame Ijen Crater tour package, Accommodation, and facility, You can visit Our partner.